Select the payment solution that’s right for you. 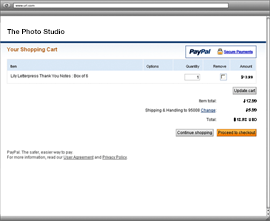 Give your online buyers another way to pay by adding a “Check out with PayPal” button. Use PayPal to process orders at home and on the go. Our team of experts is available Monday through Friday, 9:00AM-6:00PM Eastern Standard Time. Add our PayPal Checkout payment button to your existing checkout for the millions of shoppers who prefer paying with PayPal. *Ipsos Study done in July 2010 with 805 PayPal merchants. Setup is easy. 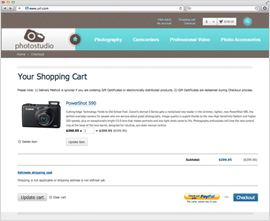 Simply add the PayPal button or integrate with popular e-commerce platforms. To take credit card orders, simply log in to your PayPal account, enter the payment details into our secure order form and we'll process the payment and send you a confirmation.